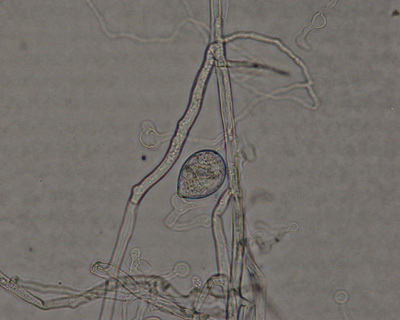 Disease symptoms caused by Phytophthora are difficult to distinguish from diseases by other microbes. Phytophthora species may infect all plant parts (fruits, flowers, leaves, stems, and roots) and cause root rots, wilting, bleeding stem cankers, shoot blights, fruit rots, and foliar lesions. In our recent survey of woody hosts in Minnesota nurseries we found many different species of Phytophthora causing severe damage. 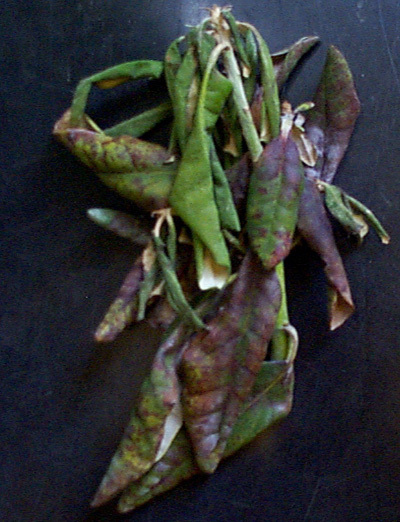 Some of the species found include P. citricola, P. citrophthora, P. cambivora, P. cactorum, P. fragariae var. rubi and P. nicotianae. The development and spread of Phytophthora diseases are favored by wet conditions. The fungus-like organism produces zoospores (motile spores) that are propelled by flagella in wet environments. Other spores, such as chlamydospores and oospores may also be produced allowing the organism to survive adverse conditions. In nurseries, if Phytophthora diseases are problematic, there are several control procedures that can reduce the impact of these diseases including chemical control, sanitation, changing cultural practices and host resistance. Phytophthora root rot must be prevented as chemicals are often ineffective in controlling this disease. Keeping nurseries free of diseased plants is very important in disease prevention. Planting on raised beds and using porous potting media may help to reduce excessive moisture and development of Phytophthora diseases. Adding composted bark to the potting soil has also been shown to reduce disease. If recycled irrigation water is used it is essential that Phytophthora propagules are not present in the water or additional cultural or chemical control strategies may be needed. 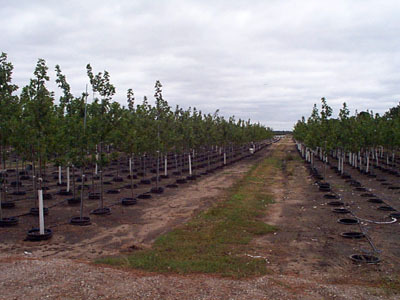 Environmental stress on woody plants also makes them more susceptible to infection by Phytophthora species. For example, drought stress, high soil salinity, and excess nitrogen fertilization may promote disease. Our research is helping nurseries provide fine quality, disease free plants and protecting Minnesota from the introduction of devastating new diseases. 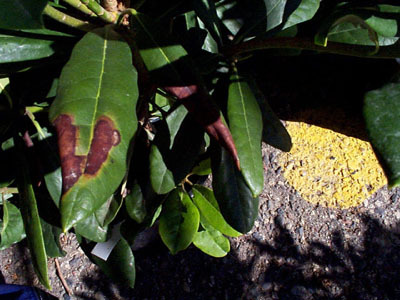 Diseases such as Phytophthora are difficult to identify and control. We are developing rapid methods to detect Phytophthora diseases affecting woody plants. 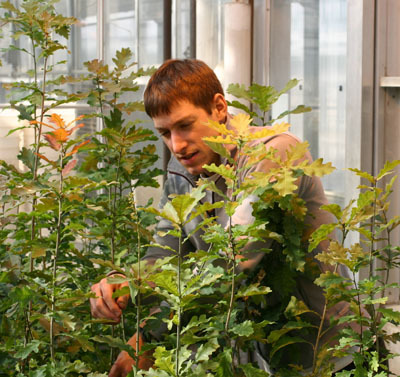 Graduate student Brian Schwingle working with oak seedlings in the greenhouse.